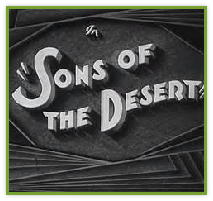 The Sons of the Desert is an international organization devoted to the preservation of the films and memory of those wonderful screen comedians Stan Laurel and Oliver Hardy. 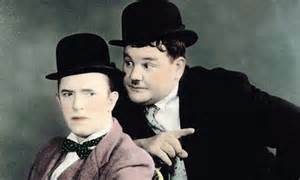 Its New York founding in 1965 was spearheaded by Laurel & Hardy biographer John McCabe. A "Tent" was soon formed in Detroit followed by others scattered across the U.S. Eventually this enthusiasm spilled across the border into Canada, Britain, Europe and other locations around the world, where the love of Laurel & Hardy proved to be boundless. 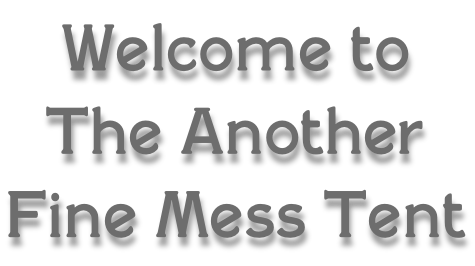 Our group is a relatively small one, with approximately fifteen members. But the enthusiasm of these members matches that of many larger tents. We were founded in 1975 and have been meeting regularly since that time. Ours is the only tent in Canada according to the Intra Tent Journal. Fans of the boys will recall Ollie's captivating rendition of "Lazy Moon" from Pardon Us. As reported in Glenn Mitchell's Laurel & Hardy Encyclopedia, this seldom recorded song was covered by Harry Nilsson in 1973.To listen to this selection click below. 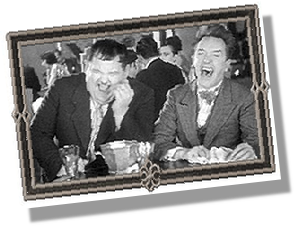 This Oliver Hardy tribute is hilarious: It's a sound file of Oliver Hardy singing "Fresh Fish" (taken from the soundtrack of "Towed in a Hole") to the accompaniment of electric guitars. Thank you, Peter Lake, for making it available. To listen, click below.